Happy End was a twenty-one-piece big band formed in 1983 by Matt Fox. There were 25 of us in all, a mixture of men and women getting together to perform political songs from around the world. The band specialised in the music of Kurt Weill and Hans Eisler. Sarah Jane remained the band's singer until 1989. The band released two albums, There's Nothing Quite Like Money for Circus Records (an offshoot of Oval Records) and Resolution for Cooking Vinyl Records. Over the course of the next few years the band played all over the country in venues as diverse as The Queen Elizabeth Hall and The Glastonbury Festival. The Happy End played over 150 benefit concerts for the miners. It broke my heart for a while when I left this band because it was like losing a family. But life had got too complicated, with the success of The Communards and a solo career looming. All good things have to end! A Happy End! 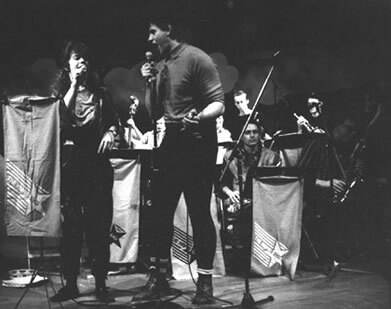 ‘The band was started in 1983 by Mat Fox with the slogan "making politics swing". Inspired by Charlie Haden's Liberation Music Orchestra, it swiftly became a large, loose and freewheeling ensemble. Despite the instrumental line-up (saxes and brass, plus vibes and accordion - up to 24 musicians at its largest - ), it was never a jazz big band as such. But it drew on that tradition - occasionally satrically, always humourously. In its more organised moments it could echo Basie or Ellington's classic hard-swinging punch, in its more disorganised ones Sun Ra's high-energy and joyful cacophony.